One of the most versatile craft supplies around can be the humble canvas bag. They're inexpensive, widely available and fun for all ages. Kids can have fun making a personalized schoolbag while adults can create a one-of-a-kind accessory. While they are available in different sizes, the most popular designs are about 12 inches wide, 14 inches tall and only an inch or so deep with two fabric straps. They're available from any craft store and stores like Wal-Mart that have a respectable craft section. Canvas bags are usually stocked in the fabric-craft section, often near the fabric paints. While the classic bag is a light beige/unbleached muslin color, they're available in everything from denim to fluorescent tones. A plain canvas bag is just crying out for paint. This will be the easiest and most fun project for kids. Hand them a few tubes of fabric paint and let them go wild. Artistic types can use the entire bag as the canvas for their next masterpiece. If you're feeling insecure about your painting ability, try using stencils, or simply create an abstract design of squiggles, swirls and dots. Photo transfer paper allows you to create an iron-on transfer with your home printer. 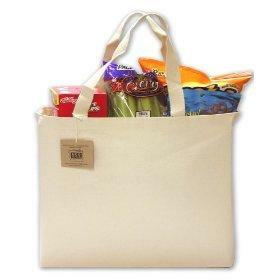 You can use a single large image or create a collage and then it iron it on to the bag. This is great way to take your favorite photos everywhere with you. While stitching through only one layer of a bag takes some maneuvering, embroidered designs give an interesting three-dimensional feel to the project. Cross-stitchers can achieve the same effect by using waste canvas. Sew on patches, buttons, lace and other miscellaneous materials. While not as durable as sewing, a glue gun can also be useful in attaching oddly-shaped finds. Who says you have to choose just one option? Why not iron on a transfer of your family portrait and then paint the names and ages of your children around the picture? Or create an ode to your dog with an embroidered Labrador and glued-on doggie biscuits. The possibilities are limited only by your own sense of fun. Now it goes against the very nature of a crafter to do this, but it's also possible to simply do nothing to the bag. Perhaps you need a small bag to carry books to work and walking through the halls with a glittery collage just won't do. When a purse just won't cut it, but you have no need for a full backpack, unadorned canvas bags are a sturdy and simple solution.